The Kreativ Blogger Award has been awarded to The Anne Boleyn Files by fellow blogger and Tudor enthusiast, Marie Burton of the Burton Review. Thanks, Marie, I really appreciate the award and am honoured to accept it. I’m so glad that people enjoy browsing The Anne Boleyn Files and finding out more about Anne Boleyn. This website is a real labour of love! The award guidelines are that on receiving the award you must post 7 things you love and then give the award to 7 other bloggers who are creative. So, here goes! My kids – Christian, Verity and Joel, who know so much more about Anne Boleyn than they really need to! My business – freelance writing and running The Anne Boleyn Files really rock! These seven blogs really deserve the award. Lady Bergavenny turns into Anne Boleyn? Thanks so much! I love your blog too! 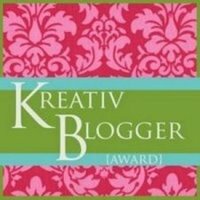 Thanks so much for recognizing my blog with the Kreativ Blogger Award. Very cool to get back to my blogs from my travels and find that you granted my blog this award. V. nice and I appreciate it v. much!